Prentice Herman Polk, acclaimed photographer, was born November 25, 1898 in Bessemer, Alabama, to Jacob Prentice Polk, a miner, and Christine Romelia Ward, a seamstress. Mr. Polk was a portraitist who was especially adept with the effects of light and dark. 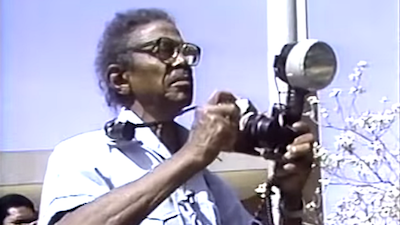 He was the official photographer for Tuskegee University for nearly 50 years from 1939 to 1985. Mr. Polk’s collection includes the educated and privileged class of black people as well as the rural, working class black people in the Alabama Black Belt. In 1917 at the age of 18 Polk entered Tuskegee Institute, later known as Tuskegee University, hoping to study art. At the time, Tuskegee did not have an art program. He instead studied photography under noted black photographer C. M. Battey. In 1924, Polk graduated from Tuskegee and moved to Chicago, Illinois where he apprenticed with photographer Fred Jensen. Polk returned to Tuskegee in 1927, where he opened his first studio and joined the Photo Department Faculty at the Institute in 1928. He became the Head of the Department in 1933. From 1939 until his death he was the official photographer for Tuskegee Institute. During his time at Tuskegee, Polk photographed four school presidents. He was responsible for taking the 1941 photo of Eleanor Roosevelt with civilian pilot Alfred Anderson that inspired the formation and the deployment of the Tuskegee Airmen in World War II in 1942. During the 1960s, he documented the Civil Rights Movement and especially Tuskegee Institute’s student protests. Polk photographed Dr. Martin Luther King Jr., Muhammad Ali, and other civil rights leaders who came to the Tuskegee campus. He also provided the local black press with images that focused on education, and frequently took images that reflected on the intense determination of African American students in the region to graduate from high school and college. Polk’s collection also includes hundreds of photos of the great scientist George Washington Carver researching in his laboratory, teaching and mentoring students. Mr. Polk and Dr. Carver had a working relationship to make sure they captured the history of the scientist’s most significant innovations. Although he was “Tuskegee’s photographer,” Polk is best-known for his photos of elderly working people in rural Alabama. His 1932 image, entitled "The Boss," shows a confident female farm worker whom he discovered setting up a produce stand near the Tuskegee campus. She stands proudly in her everyday clothes, defying the viewer to dismiss her headscarf and apron as comical or picturesque and in doing so, challenges the then popular commercial portraits of "black mammies." Prentice Polk passed away on December 29, 1985, in Tallassee, Alabama at the age of 87. Polk was buried in Tuskegee Institute’s historic cemetery on campus. John Dorsey, “Polk portraits show black life, photographic achievement,” Baltimore Sun, Jan. 14, 1991, http://articles.baltimoresun.com/1991-01-14/features/1991014070_1_polk-photographer-tuskegee-institute; P.H. Polk, http://www.bhamwiki.com/w/P._H._Polk; Malaika Kambon, “P.H. Polk, one of ‘10 essential African-American photographers’,” San Francisco Bay View, Feb. 10, 2015, http://sfbayview.com/2015/02/p-h-polk-one-of-10-essential-african-american-photographers/.